New Yorkers are no stranger to pizza. It’s a cuisine of its own in the city that never sleeps. So when you hear of a pizza restaurant that draws so many customers, they line the block just to acquire a slice, it must mean there’s something special there. 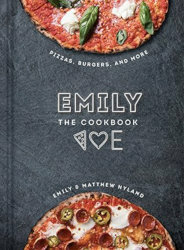 EMILY: The Cookbook shares a few of those secrets that the hugely successful husband-and-wife team behind one of New York City’s and Nashville’s favorite pizza places. These recipes are delicious and accessible: no wood-fired oven or fancy equipment required. You’ll be shown how to re-create such crowd-pleasing favorites as their famous round pizza, the iconic Detroit pan pizza, and their legendary EMMY Burger, the juicy wonder that tops many New York City “Best Burger” lists. We are pleased to announce that EMILY: The Cookbook has also just been selected by Publishers Weekly as one of their picks for Top 10 Fall 2018 Cooking and Food Books! But EMILY: The Cookbook is more than pizza and burger perfection. You’ll also find recipes for small plates (Nguyen’s Hot Wings with Ranch Dip), salads (Shredded Brussels Sprouts with Blue Cheese, Bacon, and Miso Dressing), sandwiches (Lobster Salad Sandwich), pasta (Campanelle with Duck Ragù), cocktails (a Killer Colada), and scrumptious desserts (Rocky Road Brownies with Rum Ganache Dip). Packed with full-color photos and handy tips, this cookbook is a fabulous find for people who want new ways to entertain, feed, and wow their friends and family. Before she was one of New York’s favorite restaurateurs, Emily Hyland was an English teacher, a yoga instructor, and a poet. After meeting her husband, Matt, during college in Rhode Island, her early love of great food (especially pizza!) blossomed and they opened the restaurants Emily, Emmy Squared, and Emily West Village. Matt Hyland is Emily restaurant’s chef and creator of the recipes that have made it famous. A native of Connecticut, a state where excellent pizza is a way of life, Matt came to his appreciation of great pies at an early age. After training at a variety of restaurants in New York, he perfected his craft as a pizzaiolo, and developed a unique approach to making American pizza with timeless techniques. Emily and Matt live in Brooklyn where they make and eat lots of pizza. Also, poke around @pizzalovesemily on Instagram. Just don’t do it while hungry! !